As lawmakers continue to negotiate over the debt ceiling and spending cuts, a new CBS News/New York Times poll shows that Americans overwhelmingly want Congress to raise the debt ceiling. Most would like to see spending cuts go along with that increase. Three-quarters, or 77 percent, of Americans want the debt ceiling raised, according to the poll, conducted Jan. 11-15. The Treasury Department has informed Congress that the United States is expected to hit its current debt limit of $16.4 trillion by mid-February or March. If Congress fails to raise the nation's borrowing limit, it could have severe economic consequences. The Republican-led House will next week vote on a bill to raise the debt limit for about three months, giving the House and Senate time to pass a federal budget. If either chamber failed to pass a budget in that timeframe, its members wouldn't get paid under the GOP plan. It's unclear whether the Democratic-led Senate will go along with this plan. 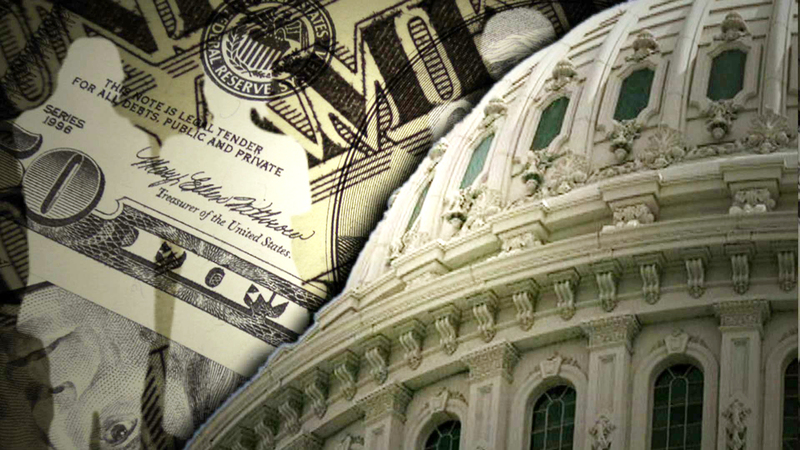 According to the poll, 60 percent of Americans want the debt ceiling raised with spending cuts. Another 17 percent want it raised without any conditions, while 18 percent say it should not be raised at all. Americans would rather see compromise than default. Seventy-three percent would prefer a debt ceiling agreement that they didn't fully support over seeing the U.S. stop paying its obligations. While Republicans are most likely to accept default, only one-fourth want that to happen. And if Americans are willing to settle, they'd like to see Congress do the same. Eighty-four percent said President Obama and Democrats should compromise, while 80 percent said congressional Republicans should. Americans harbor doubts about what this next Congress will achieve, as they did just after the 2010 midterm elections, and the recent "fiscal cliff" battle hasn't helped matters. Because of it, 46 percent of Americans say they're more pessimistic about the ability of Congress to deal with the nation's problems. More Americans (47 percent) blame the Republicans in Congress for the difficulties in reaching an agreement on the "fiscal cliff" deadline than blame Mr. Obama and the Democrats in Congress (31 percent). Another 15 percent of Americans blame both sides. There are partisan differences, with independents blaming the Republicans more. Overall, just 38 percent expect the new Congress to accomplish more than it usually does in a typical two-year period, while slightly more, 43 percent, expect it to accomplish less. Expectations for Congress were more positive just after the 1994, 1996, and 2006 elections. Expectations for Congress are lowest among rank-and-file Republicans: just 31 percent expect it to accomplish more than usual in the next two years, compared to 44 percent of Democrats. More Americans trust Mr. Obama than Republicans in Congress to handle all three issues tested in this poll -- the economy, the budget deficit and taxes. Congress continues to receive low approval ratings from the American public. Four in five disapprove of the job Congress is doing, and just 12 percent approve. Disapproval transcends partisanship, too. Eighty-two percent of Republicans and 86 percent of Democrats disapprove of Congress. Criticism extends to both parties in Congress, although congressional Democrats fare slightly better than Republicans. It's noteworthy that just 30 percent of Republicans approve of how the Republicans in Congress are doing their job. Democrats are twice as likely to approve of their own party's job in Congress. Senate Majority Leader Harry Reid, D-Nev., has just a 29 percent approval rating, as does House Majority Leader John Boehner, R-Ohio. About a quarter of Americans don't have an opinion of the job they are each doing. Thinking more broadly about how to approach the federal deficit as Congress wrestles with budgetary issues, Americans favor a combination of taxes and spending cuts to reduce the deficit. And a majority says that in principle, they would be willing to cut programs that personally benefit them - though Democrats are less willing to sacrifice than Republicans and independents. Partisans also differ on what to cut. From a list of the largest budget items, Democrats tend to favor military cuts; Republicans look to Medicare. Neither side wants to trim Social Security. One in 10 wouldn't cut any of these programs. This poll was conducted by telephone from January 11-15, 2013 among 1,110 adults nationwide. Phone numbers were dialed from samples of both standard land-line and cell phones. The error due to sampling for results based on the entire sample could be plus or minus three percentage points. The error for subgroups may be higher. This poll release conforms to the Standards of Disclosure of the National Council on Public Polls.